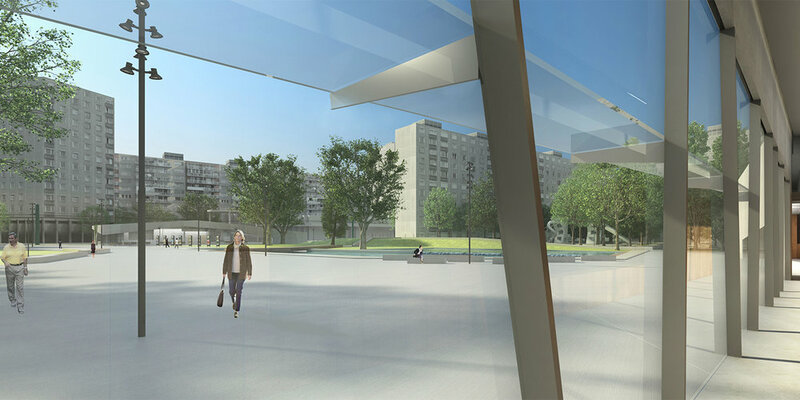 The site covers the broader settings of Ybl Miklós street and Szilárd Leó park. 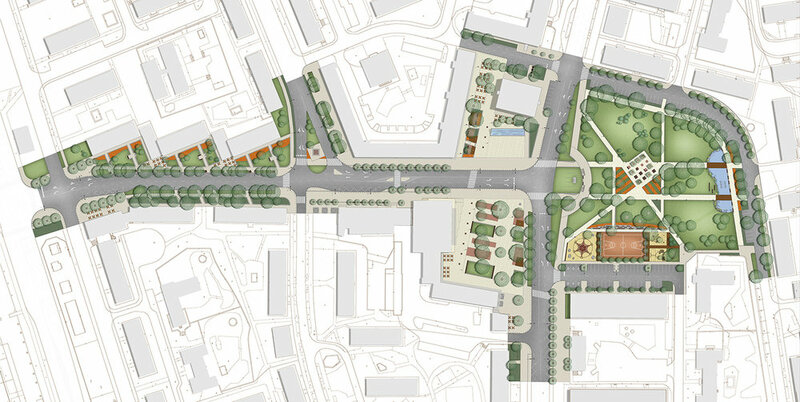 The main spatial layout of the area follows Nendvich Andor street along Ybl street to Szilárd Leó park. 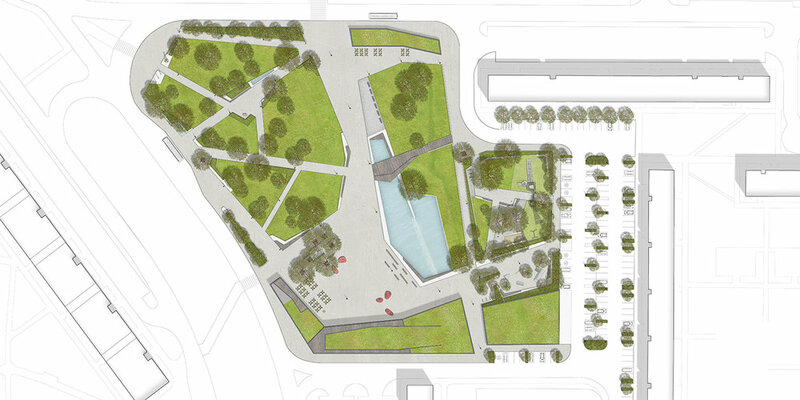 The space is constantly opening up, starting from the inner areas along the promenade to the renewed Uránbányász square. A more open, central space is created by the opening of spatial to reveal the buildings. We slightly tilted the axis of Ybl Miklós street in order to widen the walkway into a promenade in front of deparment store ’Mecsek’ and the adjacent post office. This intervention allowed the Obelisque monument to the aviation heroes to be located on the axis line. 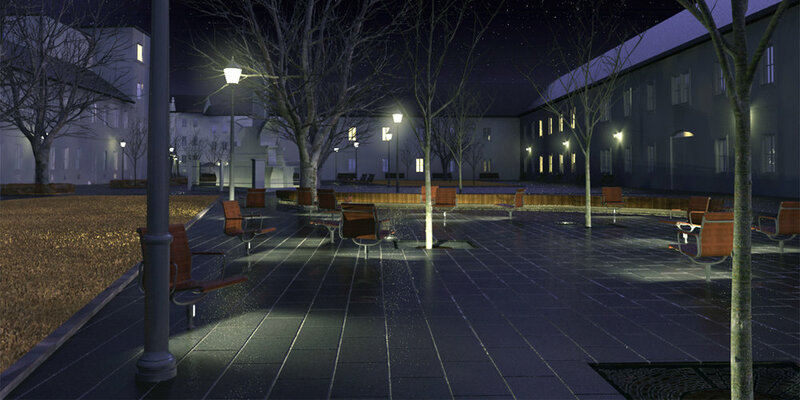 Along with new spatial structures we also added new functions that enhance the vitality of this setting. 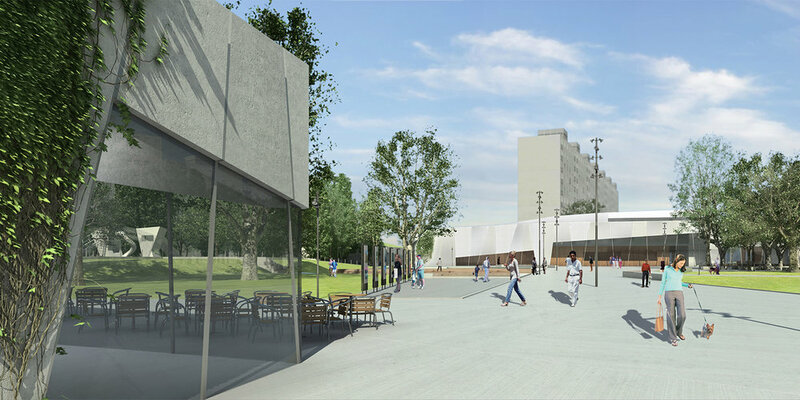 Instead of the former commercial functions, we proposed the establishment of outdoor terraces along the ground level buildings of Ybl Miklós street. We based our spatial concept on promoting pedestrian transit and community functions. 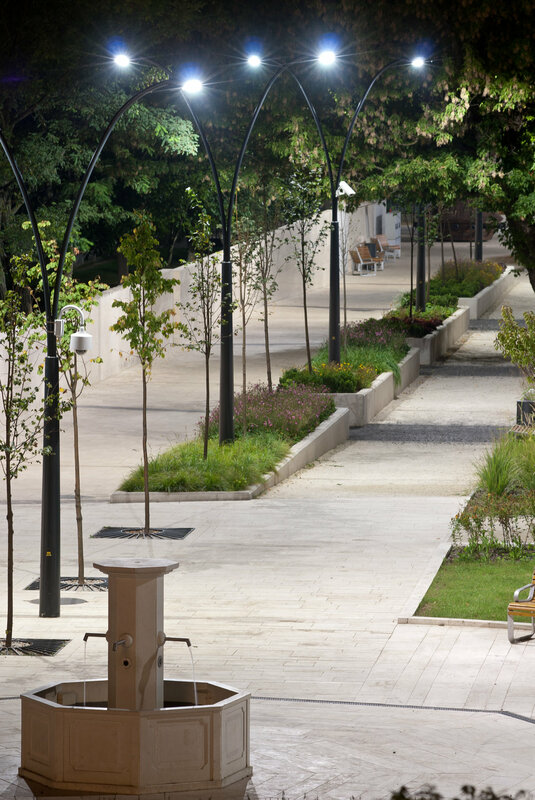 We planted an allée of trees and established a walkway on both sides of Ybl Miklós street, Építők útja street and Uránbányász square. Along Esztergár Lajos street we left the existing plants on level with elevated planting beds and laid street paving similar to the one on the promenade. 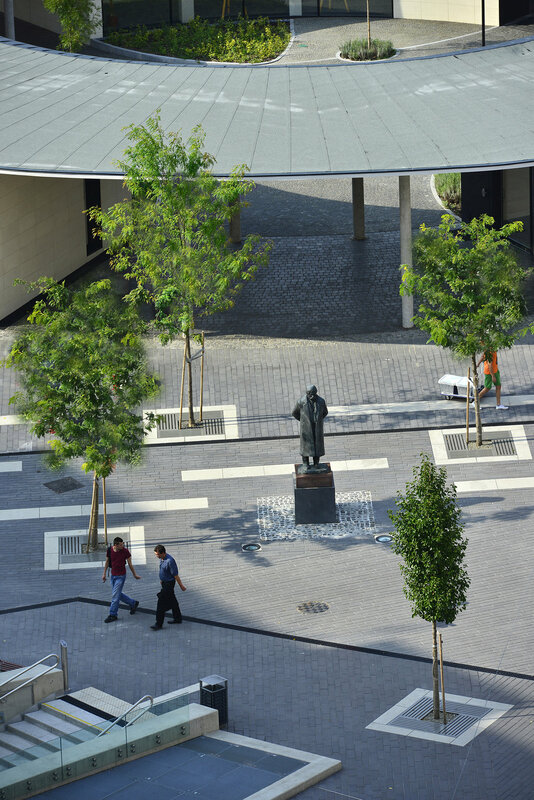 The structure of Uránbányász square is determined by pedestrian transit, this concept is enhanced with targeted paving architecture design. The busiestpedestrian routes meet at the intersection of Esztergár Lajos utca and the post office building, therefore we lef this space open. The promenade begins at this buildings and continues towards the high-rise on the opposite side. 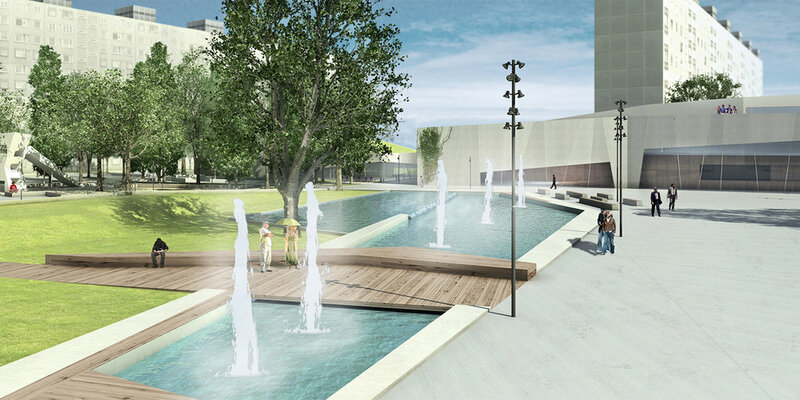 The promenade’s water features give a vertical connection between the two units. The spatial design of Frankel Leó park follows the same principle of arrangement, however, it dissolves the geometric shapes into larger green spaces and softens the built elements. 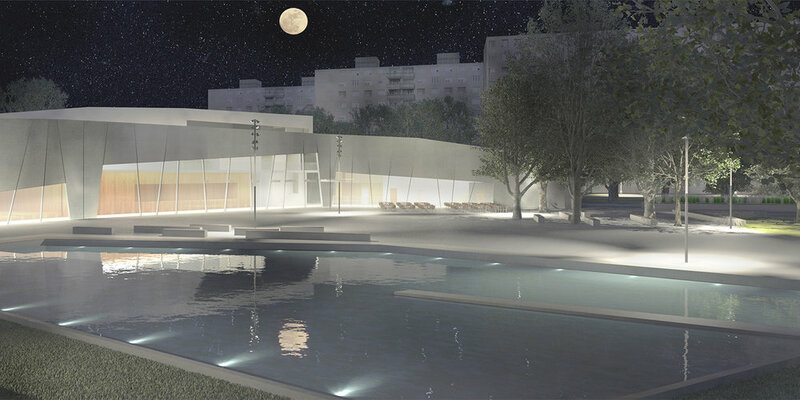 The sculpture garden in the optical center of the park becomes an interactive space for meetings, leisure, exhibits or play, with geometrically-patterned seating walls, statues and shaped trees. 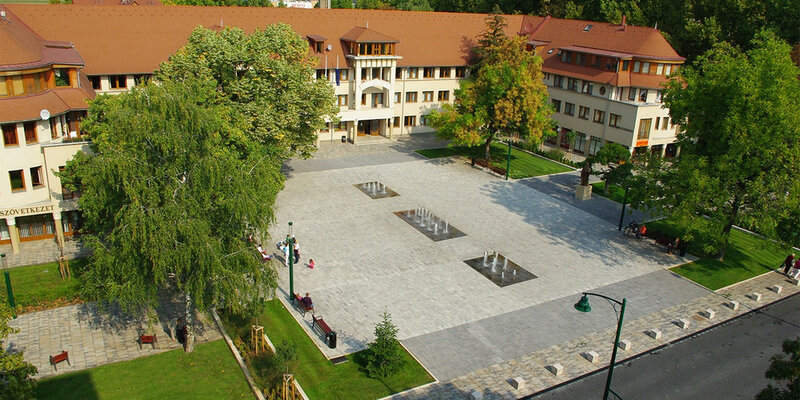 Our primary design intent was to create spatial foundations for social, economic, and environmental growth in Pécs. The reconstruction of built and natural elements of the square increases life quality in its immediate surroundings, and therefore attracts high quality services that take this growth even further towards functional diversification. Another intent of our spatial design concept was to establish individual square-segments where cultural life can take over and flourish in open space. We avoided enforcing specific uses on these public areas, and aimed to provide a transformable setting for various recreational and cultural activities. Through the visual experiences gained by passing through and experiencing urban space, the individual does not only become part of her/his own urban living environment, but also its organizer. This increase of spatial quality, the enhancement of cultural richness are shared interests of both the inhabitants and of the city. We divided the design area into several functional units, which are thematically sequenced, in a spatially separated yet characteristically harmonious manner. These units are: Hunyadi Street, Szepesy Ignác street, Széchenyi Square; Városház Square, Irgalmasok Square, and Street of Irgalmasok. New functions are placed within these spatial structures, filling them with life and activities. 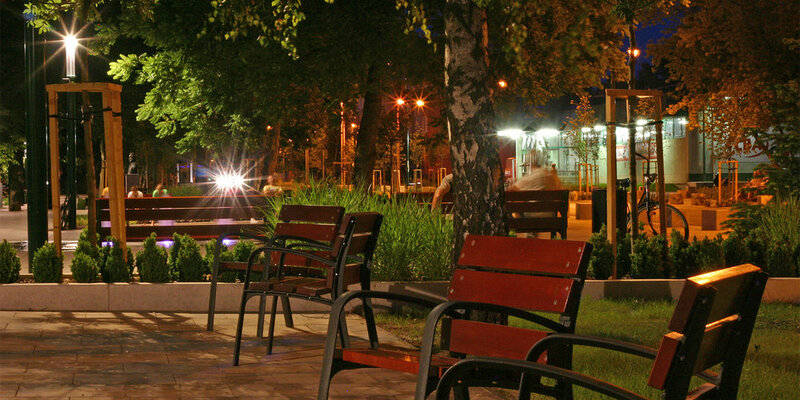 Instead of its formerly sole commercial function, we propose the installation of two outdoor terraces on Hunyadi Street. On Széchenyi Square, flush pavements provide the possibility to set up terraces in front of the facades. With the introduction and expansion of this function, we intend to increase the number of visitors and the variety of uses of this site. 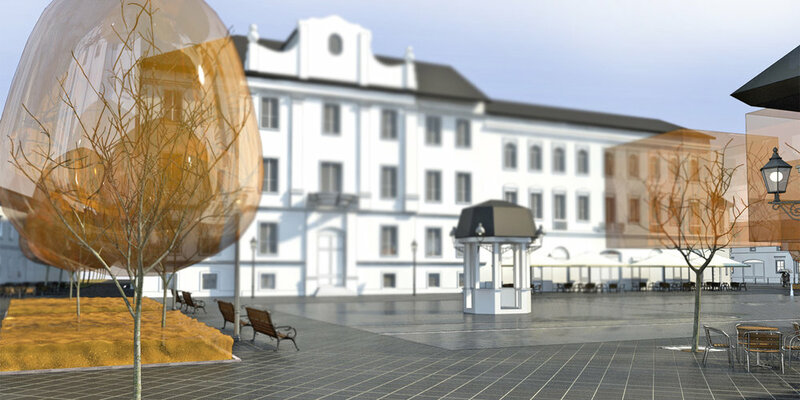 The priority areas of Városház Square and Széchenyi Square host temporary exhibition spaces (temporary arts and crafts, historical, any cultural or self-organized art expos) and public art sculptures. 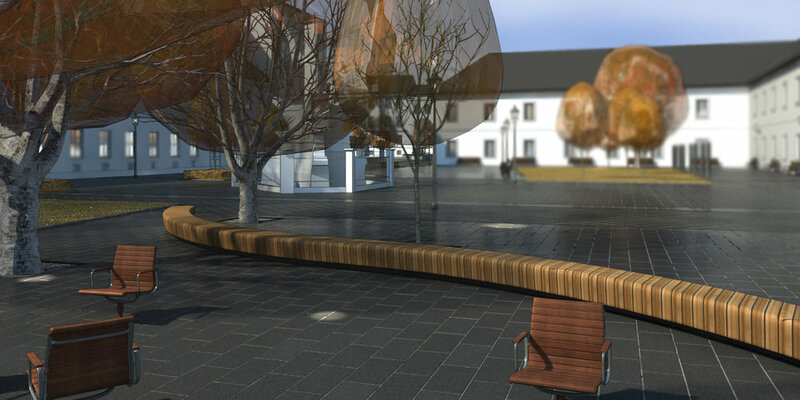 In Széchenyi Square, along the diagonal lines, temporary kiosks can be set up; the minimal slope of terrain provides and easy stroll from the diagonally adjoining walkways. The essence of our concept is for one function to strengthen another: the presence of gastronomic establishments alongside public exhibitions generates mutual benefits for visitors and economic activities alike. 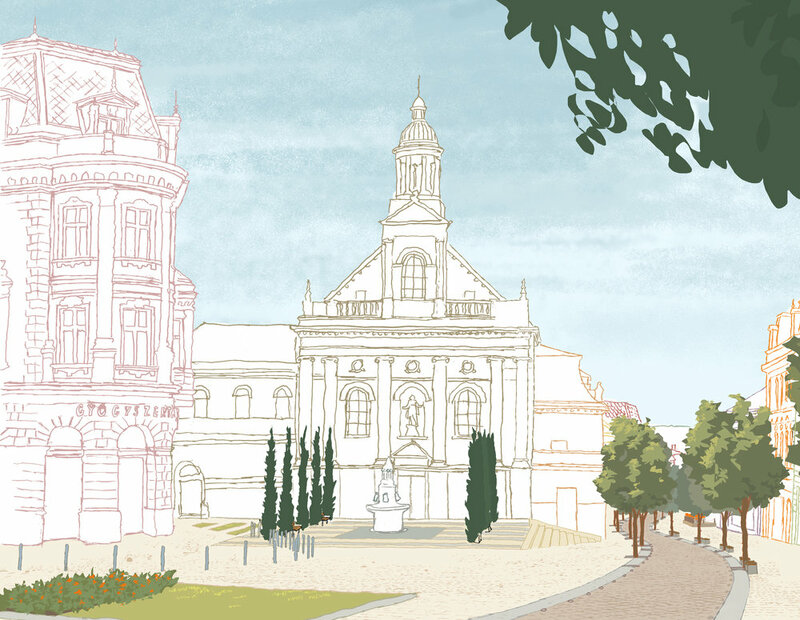 With the renewal of Fő square, we aimed to bring social, economic, cultural and environmental growth of Óbuda. The axis of Szentlélek square and Fő Square is highlighted by a connecting promenade, determined by the Zichy castle - the largest spatial wall in the area. 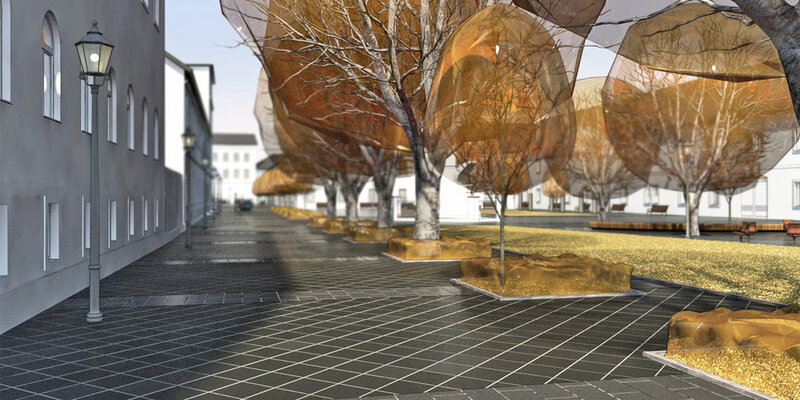 The promenade ties together and connects various spaces and elements: the umbrella statues blend with Fő Square both in terms of paving and unified space, creating a smooth transition for passers-by from one space to another. 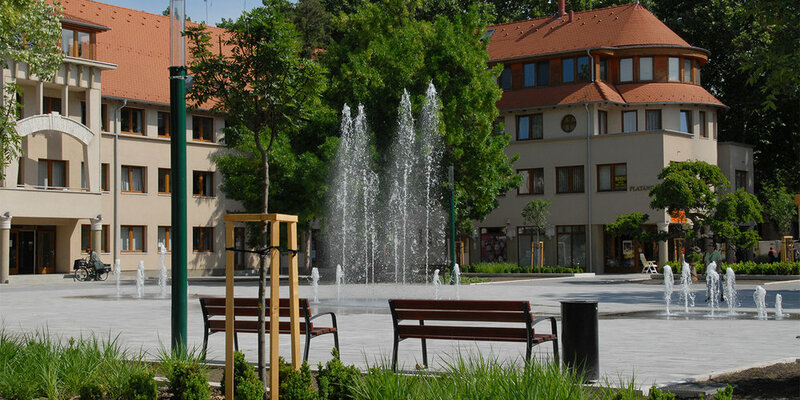 Szentlélek square receives youthful, modern street furniture and space for periodic exhibitions to encourage visitors spending their free time in the open. We also imagined revolving chairs for the square, illuminated by night to make this space more interactive at all stages of the day. 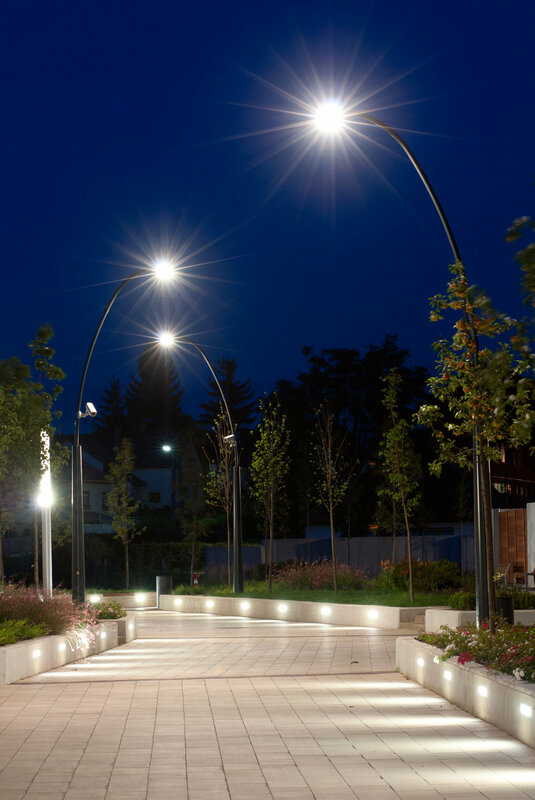 The pressure points of the promenade are highlighted with fountains along the axis, this rhythm is furhter enhanced by pavement bands. The imposing mass of the castle is softened by columnar trees. 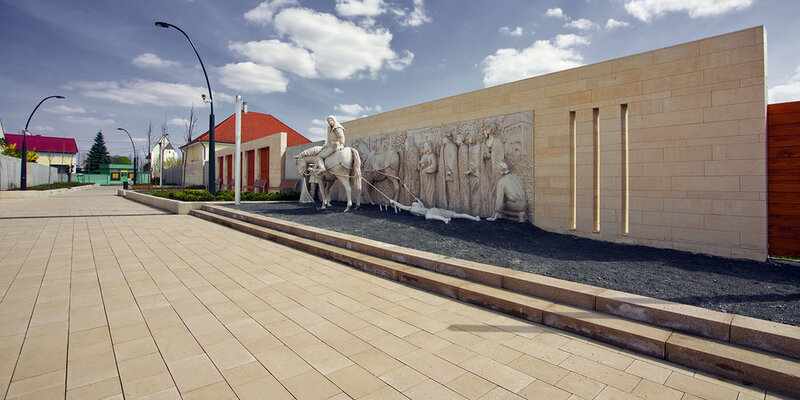 Fő Square becomes a classical, representative square to match its classical surroundings. The gas gathering station stays on its original location, since it has become a landmark to the square. It is advisable to reconstruct it with a pavilion-like appearance that may even operate as a meeting point. 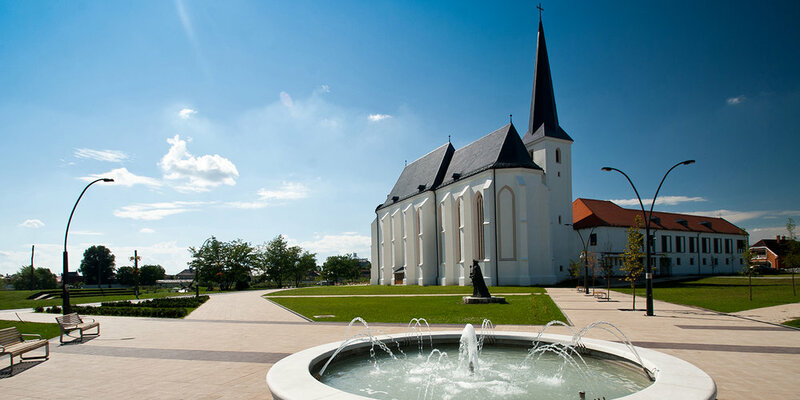 The primary function of the Historical Promenade is to provide a pedestrian access between two high-value monuments: the Minorite and Reformist churches. After its transformation, the promenade itself also becomes into a tourist attraction. Beyond the permanent set of statues, the space offers grounds for temporary exhibitions, events and concerts in this open air gallery. Gastronomic and commercial functions are also placed randomly to encourage visitors enjoy a longer stay in the city and use the promenade. 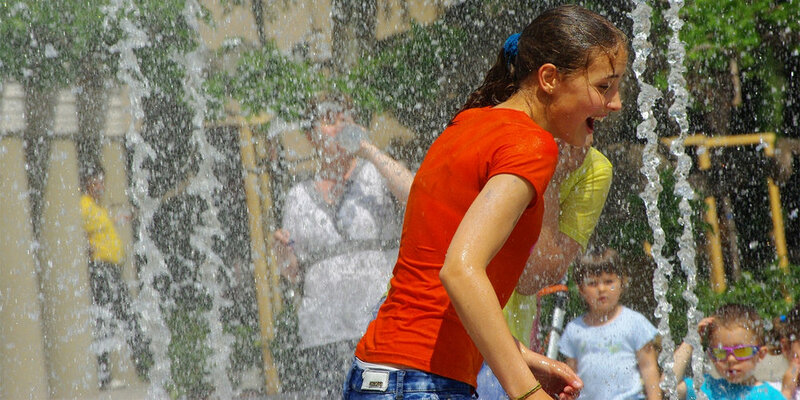 Water architecture provides a pleasant thermal comfort in the summer heat. The new promenade offers sights and activities for all visitors, let them be locals or tourists. By exhibiting local history, this newly redeveloped public space enhances patriotism and improves the quality of local built environment. Our concept emphasizes that the area can only become a vital center to its neighborhood if its urban characteristics are strengthened, its uses become multifunctional, these functions gain a broader spatial influence, while the square itself and the surrounding buildings become local landmarks. Besides the broad spectrum of functions this multifunctional space has to offer, its ability to host events, exhibitions of different scales and types in different seasons is also essential. It is intended that the inhabitants are able to freely form the square into scenes of their unique social, artistic and cultural life. The spatial influence of the square grows along with the enrichment of functions and the improvement of quality and therefore attracts a wider, more diverse social crowd. The diversification of the city’s aging population by attracting younger age groups was a fundamental, long term design intent. The square and the facing buildings become landmarks that anyone easily recognizes. The community house and the square turn into a new entity, that inhabitants can claim their own - a space to express their emotions, personality and goals. Móricz Zsigmond Circus is one of the most important traffic nodes of Újbuda. It is an intersection of a great number of tram and bus routes, and - since spring 2014 - has also become a station of Metro Line 4. Design work of the Circus started in 2001 as part of Metro Line 4 project, and resulted in the reconstruction of arched green spaces and numerous passenger underpasses around the famous ‘Mushroom’ building. In the 13-year period, both the client’s needs and the infrastructural concept changed considerably. 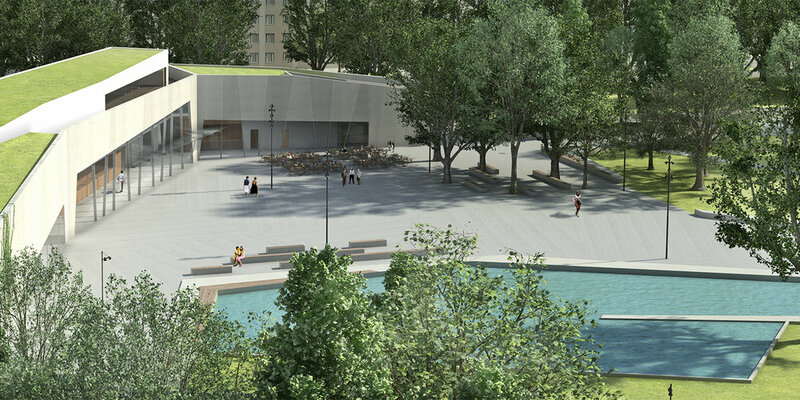 Besides aiming to create harmony between facades of various styles, the square also provides a new, safe passenger surface, a pleasant open space to spend time on, surrounded and intersected by attractive green surfaces. The new dark shade pavestone is the integrating force of this many-sided architectural environment, which functions more than just a passage to those walking in the area. We used materials with low reflexive features to make the space receptive, while the modest architecture of the covering provides a link between the ‘Mushroom’ Building and other destinations within and from the circus. 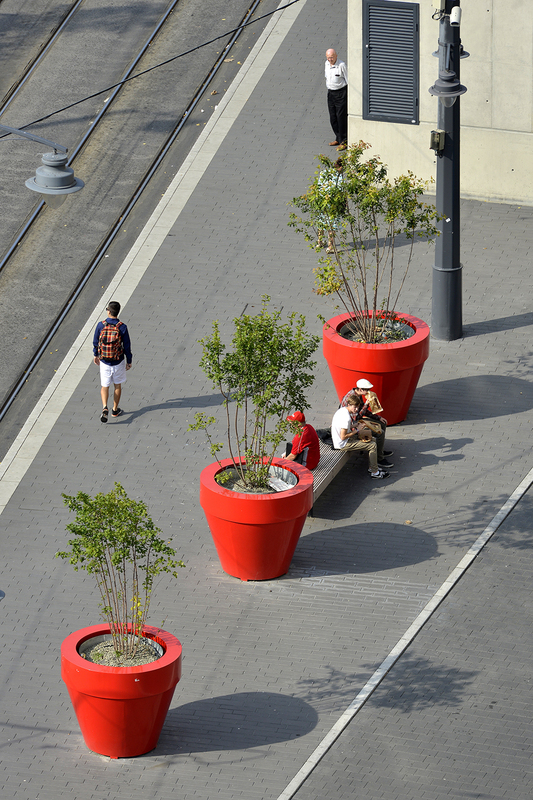 The composition of red, large sized plant containers provide a playful, vivid experience. The square has considerable passenger traffic at present, however, the new design allows not only passing but relaxation, observation and meeting as well. It is transparent and modest. It meets the various requirements of a big city. 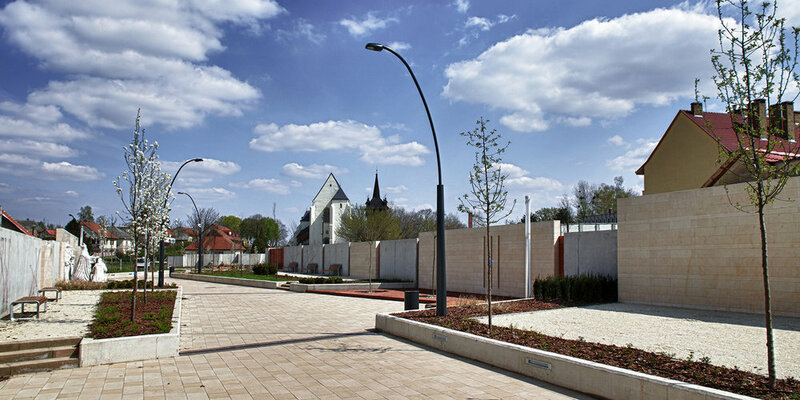 Our main design intent was to create spatial foundations for social, economic, and environmental growth in Dánszentmiklós. The reconstruction of built and natural elements of the square increases life quality in its immediate surroundings, and therefore attracts high quality services that take this growth even further towards functional diversification. 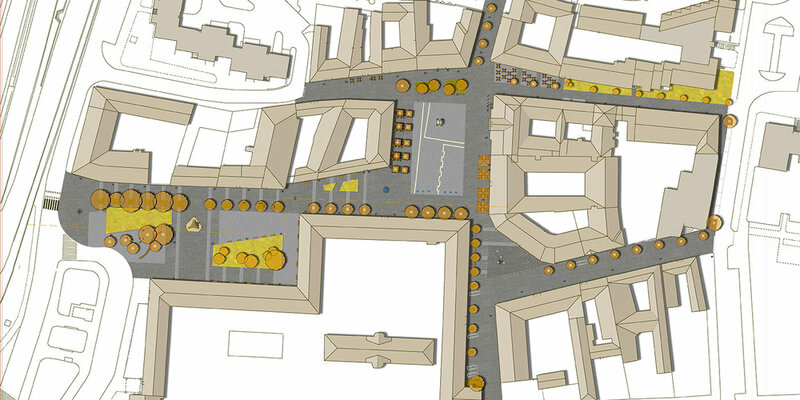 Another intent of our spatial design concept was to establish individual square-segments where cultural life can take over and flourish in open space. We avoided enforcing specific uses on these public areas, and aimed to provide a transformable setting for various recreational and cultural activities.